The Most Wonderful Time Of The Year… To Have Cryosurgery! A lot of our patients find that Christmas and New Year is the ideal time to come for clinic for treatment. It’s a wonderful time to visit out London Clinic, and our Sheffield Clinic is very close to one of the UK’s best shopping Centre’s, Meadowhall. We have appointments available around the festive period, so it’s never been a better time to make use of your annual leave! The closest… or the best? We are happy to assist with travel arrangements, hotel bookings, travel advice and medical terminology specific translators for your appointments. 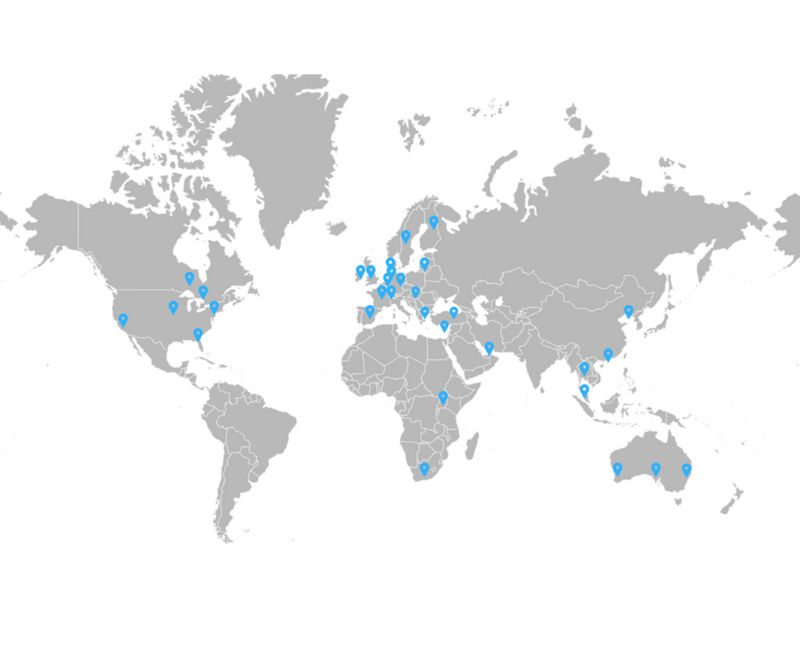 All of our FAQ’s have been translated into our other languages, so you can get the information you need! Did you spots us in The Mail on Sunday? 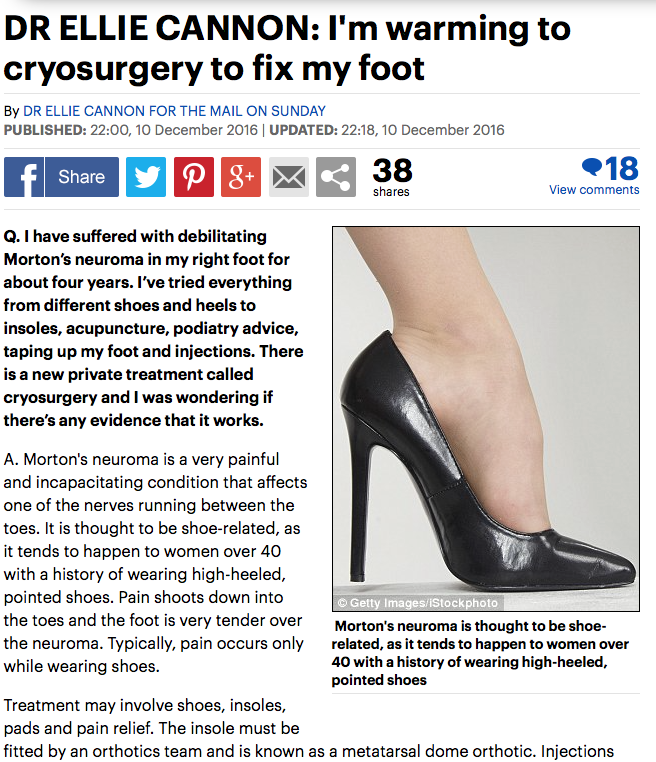 Cryosurgery for Morton’s Neuroma was highlighted in Dr Ellie’s feature in The Mail on Sunday. If you missed it, CLICK HERE to have a read! Christmas is fast approaching, and for a lot of people, it’s a great time to relax and recharge! Many people take advantage of this break from work to arrange their Cryosurgery and allow for extra recovery time. Our clinic shutdown period is from the 23rd December – 3rd January. Appointments in the new year will commence from Tuesday 3rd January. Merry Christmas, and Happy New Year from the entire Barn Clinic team. With the rise in popularity of cycling since the success of British riders in the Tour de France and Rio Olympics, the number of cycling related forefoot problems we’ve seen at The Barn Clinic has increased. This is no great surprising considering cycling requires the transfer of power from the legs in a ‘piston like’ motion through the pedals. The resultant compressional forces can detrimentally affect the delicate nerves in the forefoot resulting in burning, tingling and numbness in the forefoot. Don’t Let Morton’s Neuroma Ruin Your Tennis Season! It’s that time of year again when Wimbledon takes over and the UK catches a case of the annual tennis bug. Wimbledon finalist Milos Raonic has famously been suffering with Morton’s neuroma, so we think a huge ‘congratulations’ is in order for him overcoming his neuroma, and bagging second place at Wimbledon. But what if you’ve not been as lucky as Mr. Raonic, and your Morton’s neuroma is holding you back from getting back onto the courts? Well, at The Barn Clinic we know tennis (and we LOVE tennis). Having treated a Wimbledon Men’s Champion, we like to think we’re pretty knowledgeable about the unique strains and requirements that tennis places on our feet. Of course everyone’s heard of tennis elbow, but you might be surprised to learn that the most common tennis injuries are related to the foot and ankle. Here are our top tips for managing that Morton’s neuroma pain and keeping your feet comfortable during tennis season. We are The Barn Clinic; experts on Morton’s neuroma and in podiatric cryosurgery / cryotherapy. Please contact us for advice and to start your treatment.